The U.S. Senate Intelligence Committee released several Facebook ads allegedly purchased by Russia-linked organizations during the 2016 election. In the flurry of election-related posts to hit your News Feed last year, did you happen to scroll past ones that mentioned the "Islamization of Texas" or calls for Texas to secede? Perhaps you were encouraged to "like" a post if you wanted Jesus to triumph over Hillary Clinton in the 2016 election? If so, you were likely being targeted by the Russia-backed ads that have been in the news lately. At a Wednesday U.S. Senate Intelligence Committee hearing, Chairman Richard Burr released several Facebook ads allegedly purchased by Russia-linked organizations. None from Burr's office mentioned Clinton or Donald Trump; instead, they touched on immigration-related issues in order to widen divisions among the U.S. electorate. 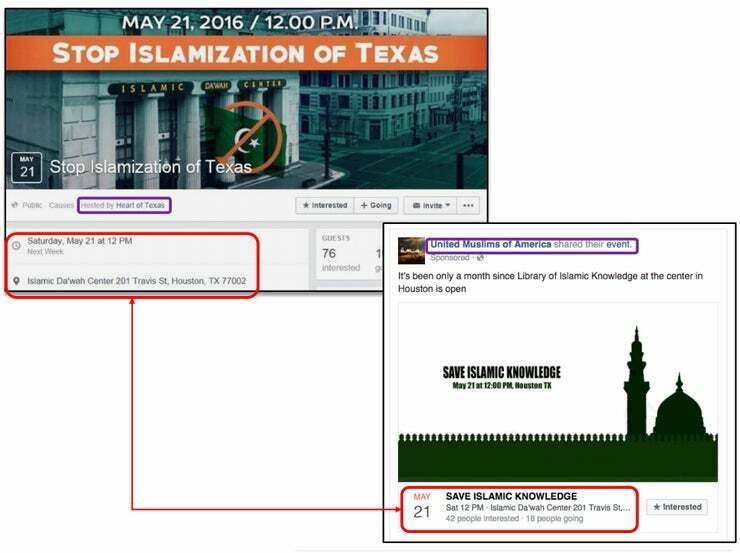 Among them was an attempt to get pro-Texas Facebook users and Muslims to clash at competing events in Houston on May 21, 2016. 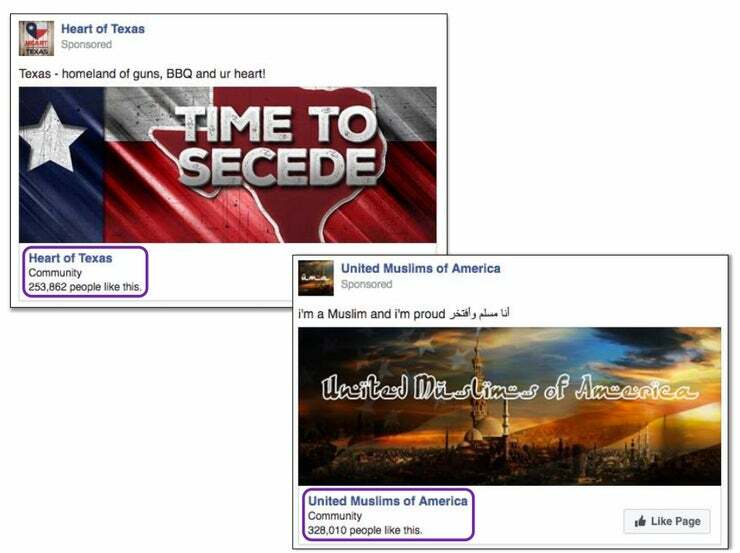 The pro-Texas page -- called Heart of Texas -- encouraged its 253,000 followers to gather at an Islamic Center in the city on that day to stop the "Islamization of Texas," while a "United Muslims of America" page, which had 328,000 followers, pushed an event at the same time and place, calling on supporters to "Save Islamic Knowledge." To gain more views, the pages bought ads on Facebook promoting the event. The effort worked. 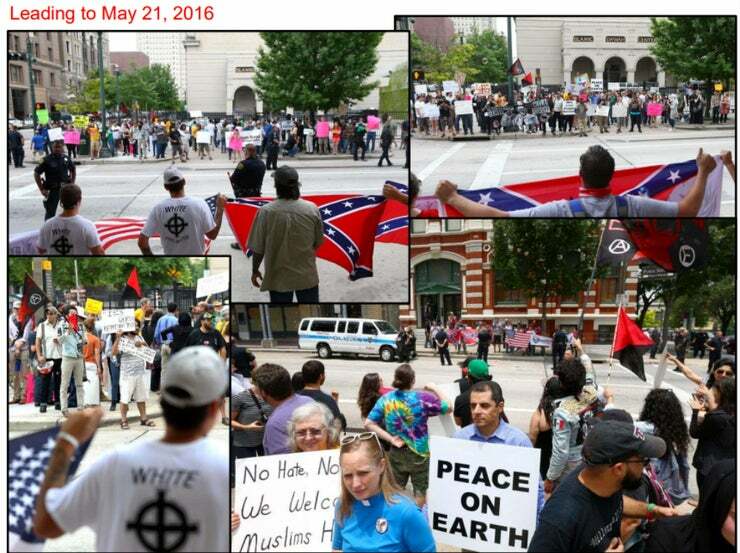 Followers of both groups held protests at the same site on the same day, as you can see in the photos below. "What neither side could have known was that Russian trolls were encouraging both sides to battle in the streets," Sen. Burr, a North Carolina Republican, said during Wednesday's hearing. "Ironically, one person who attended stated, 'The Heart of Texas promoted this event, but we didn't see one of them,'" Burr added. Later in the day, the House Intelligence Committee also released a number of ads it has reviewed, which targeted conservative and liberal groups; click through the slideshow to view them. The political ads also tried to lure in Christian worshippers. 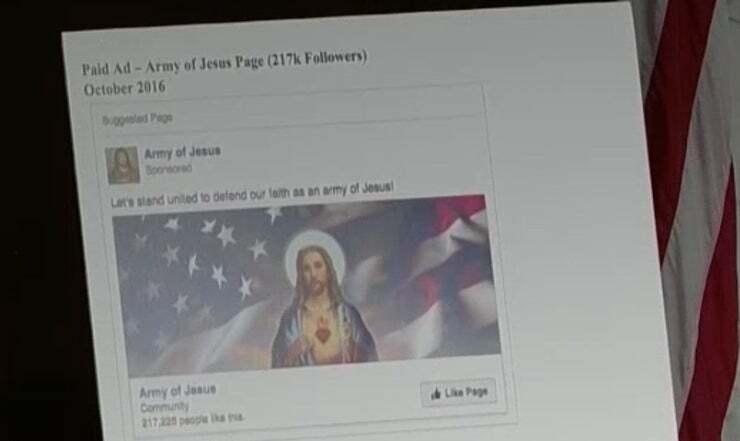 One such ad promoted a Facebook page called "Army of Jesus" in October 2016, potentially helping it attract over 217,000 followers. 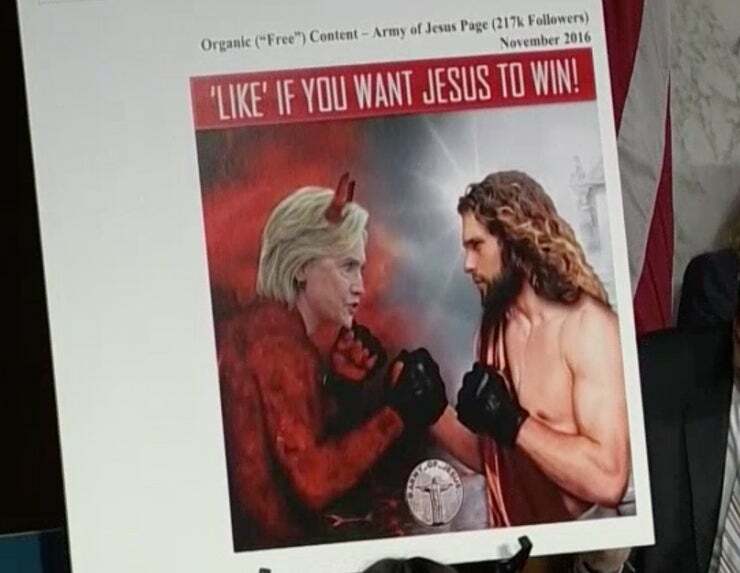 Then in November, the Facebook page published a non-paid post, depicting Hillary Clinton as a devil ready to fight with Jesus Christ. "This is another example of how people are lured in," said Sen. Mark Warner of Virginia, ranking member on the committee. "Then they are manipulated by foreign actors and foreign agents." Facebook and Twitter have been supplying U.S. lawmakers with the ads and posts as Congress considers how best to stop Russia and other foreign governments from manipulating social media in future elections. Efforts are ongoing, Sen. Angus King said, pointing to hashtags that are being promoted on both sides of recent politically charged events -- like NFL players' decision to take a knee during the national anthem -- in order to get people riled up on social media. For now, the Senate is considering a bill that would require more transparency about who funds ads posted on social media. During Wednesday's hearing, Sen. Warner -- a co-sponsor of that bill -- said he was dismayed at Silicon Valley's slow response to the problem. "Many of us on this committee have been raising this issue since the beginning of this year and our claims were frankly blown off by the leaderships of your companies," he said. Twitter, Facebook and Google sent their lawyers to today's hearing, as they did for a similar hearing yesterday. At both events, senators said they were irked by the decision, arguing that the CEOs of the top tech firms should have been in attendance. There are many more Russian-linked ads and posts, some of which were on Twitter and Google. However, the Senate Intelligence Committee is divided over whether to release them to public, according to Sen. Martin Heinrich, a New Mexico Democrat. To view some of the Russian-linked ads and posts you might have been exposed to, click through the slideshow.